Bunkers are not in plentiful supply at Farnham golf course, but each one is very well positioned and in the main large and dead flat. They are not manicured as one might expect, but aesthetically natural which is the overriding feeling of the whole estate. 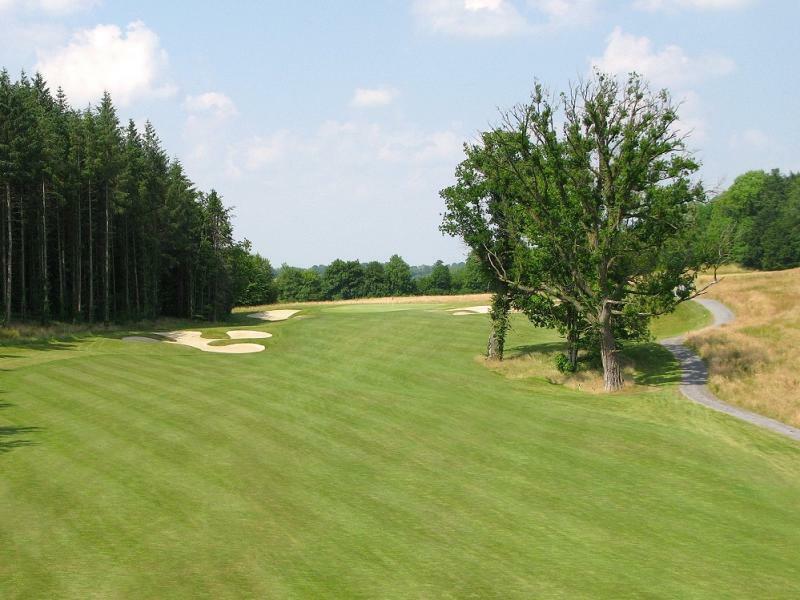 The greens are a near-perfect texture and allow for a wide variety of possible pin positions, facilitating the enjoyment of all categories of golfer. The contours are interesting but sensible. Par 4- The generous fairway awaits your tee shot, the approach shot always plays 1 club more due to the severity of the slope. Par 4- A right to left tee shot should put you in the best positions for a tricky approach shot over water, the back left of the green is always a popular area that gathers approaches. Par 4- A dog leg right where the bigger hitters have a chance to leave themselves a short approach shot by taking on the water, a fairway wood and a mid-iron may be the better option however as the hole has a generous size green. Par 4- Our signature hole, recommended to aim towards the big trees in the fairway and trust the slope to do the rest, once in position the green is protected by water right and long. A 4 on this hole will produce the biggest smile of the day. Par 3- The first par 3 on the course is a tough but fair hole which is well protected by bunkering. Par 5- A long strategic par 5 where once on the fairway from your drive the challenge is to position the second shot between large bunkers that contain golf ball magnets. Once these have been dealt with many golfers like to take a breath of relief before moving on to their next shot. Par 4- A strong par 4 where the first objective is to avoid the bunkering left. Once that has been achieved you will be left with a short iron to a narrow green. Par 3- The second par 3 on the course and what a gem it is. Reading 189 yards from the tee to a green which is protected by a drain to the left, catches any shot that has been pulled. The bunkers to the right are the general bailout area. Par 5- A fair par 5 at the turn avoid the bunkers from the tee. The bigger hitters who fancy hitting it in two have to manipulate the ball between the front left bunker and the drain which runs all the way up the right hand side of the hole. Par 4- A short par 4 to a narrow green where the slope of the fairway should bring your ball to the right hand side leaving you a full visual of the green. Par 4- The longest par 4 on the course require a drive to the left centre of the fairway in order to give you the best view of the green. Par 3- The first par 3 of the back 9 from a slightly elevated tee you must safely manoeuvre the ball to the centre of the green all the while avoiding the bunkers on the left. Par 4- This par 4 is nestled between two forests where accuracy is a must. Once finding the fairway a sloping green awaits your approach shot. Par 4- The shortest par 4 on the course. Any shot of 200 yards should leave a nice pitch into a slightly elevated green. Par 5- The longest hole on the golf course stretching along a tree lined fairway. The second shot must be kept to the right to give yourself the best angle to the green for your approach. Par 3- A picturesque par 3 from an elevated tee box looking down to a generous green defeated by large bunkers both left and right. Par 4- Straight forward par 4. Miss the bunkers off the tee to leave yourself a mid- iron approach to the green. Par 5- A strong par 5 where the player must negotiate his drive away from the lake on the right a good lay-up with the 2nd shot will leave a short-iron approach to an undulating green.